Success for Paris Family History Show! 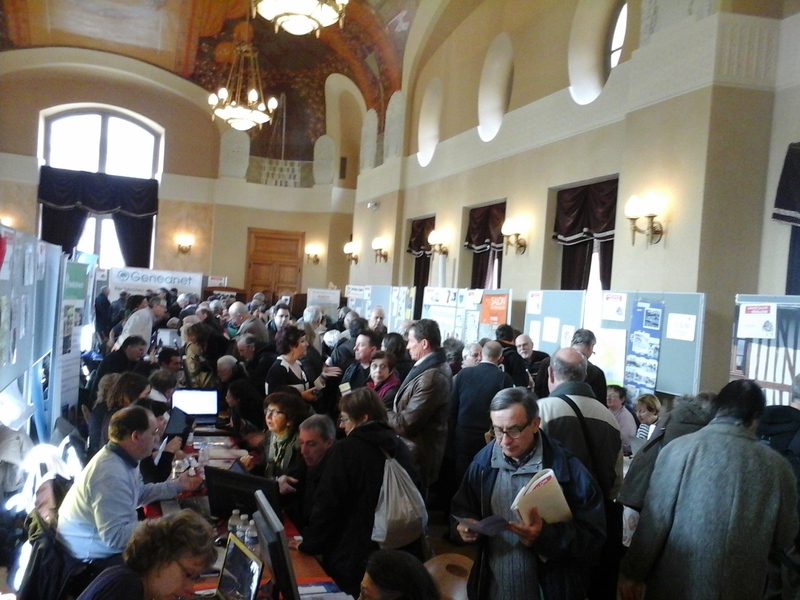 Publié le 8 mars 2015 8 mars 2015 CatégoriesFamilies Stories, France-Events (EN), Recent NewsLaisser un commentaire sur Success for Paris Family History Show! Numbers aren’t out yet but we can already say that the new Family History in Paris has been a huge success! Hundreds,or rather,thousands have gathered in the Mairie of the XVe arrondissement of Paris to celebrate family history and help amateurs and more experienced researchers. Organized by the well-known edition house, Archives et Culture, the show offered different conferences and booths from all over France from Languedoc to Dunkirk not forgetting of course the important subjects of military or seamen ancestors. The visitors could also seek help on the Belgian, Italian, Jewish, Arabic side of their trees not forgetting the British of course. At some point,the place was so crowded there was no point trying to make a way into the alleys and the organizers had to distribute more than welcomed water bottles to dehydrated exhibitors. No doubt! This won’t be the last genealogical « salon » in Paris!